If you took a poll of 1,000 Americans and asked them what they thought their most important right was, the right to privacy would surely end up one of the top answers. However, a recent federal ruling for a case that originated in New Jersey has all but eliminated Muslim citizens right to privacy. Numerous Muslim citizens filed suit against the state, alleging they were being spied on solely because of their religious background. The citizens said they were spied on in restaurants, mosques, and even schools. The judge said there was not enough proof to show that these people were being targeted only because of their religion and therefore, dismissed their claim. One of the plaintiffs in the case was even a U.S soldier who put his life on the line for the security of this country yet instead of being praised for his bravery like other soldiers; he had his privacy infringed on due to baseless suspicions. While it is a serious problem that these citizens had their privacy stripped away, we must also look at the bigger picture. It is easy to easy to how this ruling can quickly snowball into every Muslim citizen being followed and spied upon by police and the police never having to provide legitimate, or really any reason, for their behavior. Are we really ready to ok behavior that mirrors the famous book 1984? I hope not. There is no problem with doing what is necessary to protect this country from future terrorist attacks, with necessary being the key word there. To follow a group of people simply because those people share the same religion as those who committed those heinous acts against our country is not justified. The law must implement a sort of check list of other factors that, when taken together, would lend stronger credence to the possibility of those being followed being involved in terrorist activities or groups and thus would justify following and spying on them. Many Americans think that they have a fundamental right to privacy that is provided to them by the Constitution. The fact of the matter is that there is not an inherent right to privacy in the Bill of Rights or the Constitution. This is a scary concept. I am a very private person, but I feel that the government is aware of all of our actions. Our cell phones can be used as tracking devices. There are applications that can tell what television shows people watch. The government is also able to access our search history. There is no privacy in this world of technology. It is a shame, but there is profiling in everything. People are profiled at airports based on how they look, their race, gender, or the type of ticket they have. Police officers might even profile people base on the type of suspect they are looking for. 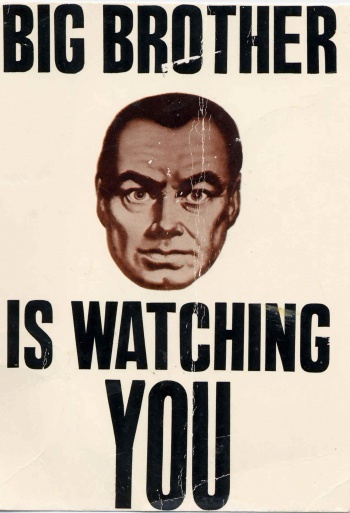 It is not fair, but in this type of society where Facebook, Twitter, social network sites, computers, and smartphones reign supreme, we never know who is monitoring our actions. This is a blatant infringement on the right to religious freedom, allowed by the US Constitution, and needs to be dealt with accordingly. Through these surveillance techniques the US Government is implicitly discouraging people to follow to the Muslim faith. People who are even considering devoting their life to Islam will have to entertain even more questions, and doubts, as a result of the rampant spying. They will have to be wary that the US Government will begin prying into their lives just because they are Muslim and they would question if it was worth dedicating their lives to Islam and simultaneously suffering harassment. This would definitely not fly if this was happening to a Christian or for that matter a member of the Jewish Faith or even an Atheist. The US Government’s obsession with Muslims is beyond belief and needs to be rectified. As United States citizens, we should feel secure that we can practice our faith without issue or problems, but because the religion is different than what traditional US culture is accustomed to, they are receiving heightened scrutiny which is unfair, unjust and definitely against the US Constitution. While it may be true that more recent many of the terrorists that have attacked the US and its allies are Muslim, not all Muslims are terrorists. This irrational belief has no basis in logic and if brought to an extreme would lead us to believe that anyone who posed a danger that was from part of a particular should instill fear in our very being. Should we be afraid of all White Americans because the KKK is made up of all white people? Should women be afraid of all men because majority of violence on women is perpetrated by men? Should we be afraid of all inner city youth because some are involved in gangs and criminal activity? I would hope that all the answers would be no. This logic should extend to Muslims. Those practicing Islam are nothing to fear, Terrorists are what we need to be afraid of and those criminals who subvert the laws instill fear and pain and anguish in people. “They who would give up essential Liberty, to purchase a little temporary Safety, deserve neither Liberty nor Safety.” These are the words of Ben Franklin, one of the founding fathers of our nation. I disagree with the wide-scale spying on Americans in general, but also particularly those who practice Islam. As Isaias has stated above, not all Muslims are working with terror organizations and should not be subject to all of their privacy rights being violated by the Government. The problem I believe is all the legislation passed by Congress in the wake of the horrible events of September 11th are too broad and can encompass many with very little. I do agree that our intelligence community needs to gather the intelligence for the safety of the nation, but there needs to be a healthy balance. It seems that there is no balance between civil rights and national security, with national security trumping basic rights. I would argue that instead of broad and vague guidelines, citizens should demand strict and specific ones to make sure all American’s rights are protected. Also, provisions these individuals filing claims in the courts should enjoy since the freedom of worship is Constitutionally protected by the 1st amendment.